Running Xillinux on the Zybo board, this is how I toggled a GPIO pin from a plain one-liner bash script in Linux. 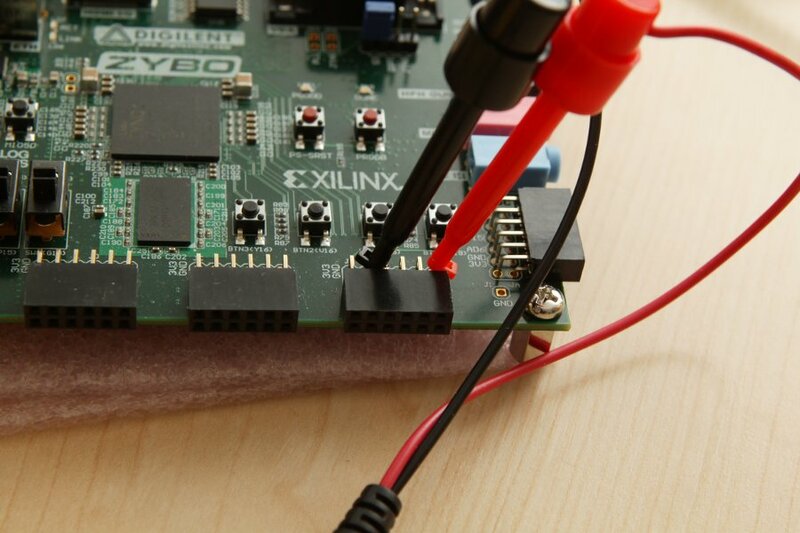 The same technique can be used for other Zynq-7000 boards (Zedboard in particular) to easily control GPIO pins. First, I looked up which GPIO pin it is. The pin assignments can be found in the FPGA bundle, in xillydemo.ucf (or in xillydemo.sdc, if Vivado was used to build the project). So I choose to connect to PMOD header JB, first pin, and the PMOD’s GND. So it’s quite clear and cut that the PS_GPIO signal is connected to PMOD B. It doesn’t hurt taking a look on the board’s schematics as well, if you’re convenient with those drawings, and see that the Zynq device’s pin T20 indeed goes to PMOD B, and which pin. The offset between PS_GPIO numbers and those designated by Linux is 54. So this pin is found as number 32+54=86. This runs at a staggering 2.9 kHz. Pretty impressive for the slowest form of programming one can think about. Hi, I was wandering where I could find a reference on the offset value 54, how can I determine it (or where is written)? for while loop, should Be while((1)), right? Is it possible to export an entire binary file in bash this way? You mean like set up some clock/data protocol and transmit a file this way? That’s rather bizarre, but given some standard UNIX utilities one could write a script that sends a file through the GPIO. I suppose. But using Linux C API for GPIO is by far more natural, I believe. Next Post: i.MX: SDMA not working? Strange things happen? Maybe it’s all about power management.